With his final assist in Monday’s loss to the Trail Blazers, Dwyane Wade became just the eighth player since 1984 to post 20,000 points, 5,000 assists and 4,000 rebounds. 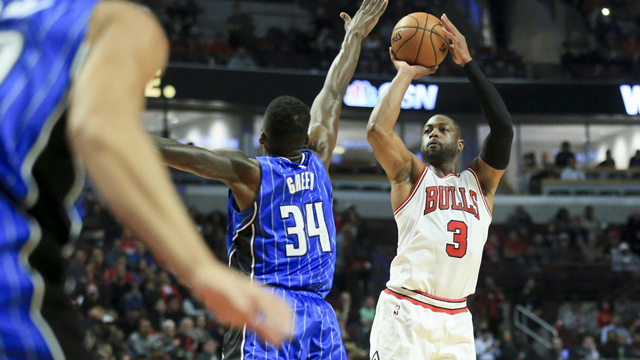 “Every year people keep waiting for the drop off with him and it hasn’t come yet,” said Pistons coach Stan Van Gundy, who coached Wade his first two-plus seasons in Miami. “You just have to try to keep guarding him the best you can. He always has been effective and efficient. Wade finished his third back-to-back set of games this season. He has rested in the second game twice. Wade played 34 minutes in Tuesday night’s 102-91 loss to the Pistons and scored 19 points while finishing his third set of back-to-back games. He has rested in the second game twice.